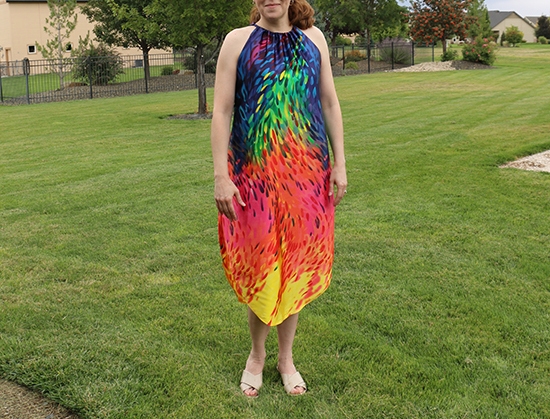 Earlier this summer, I bought three yards of a silky fabric with the thought that it would be fabulous as a dress for a wedding I was going to attend. I forgot to write down any information about the fabric, unfortunately, but here it is. Isn’t it gorgeous? And then life got busy so the fabric sat, which wasn’t entirely a bad thing because I didn’t have a pattern in mind initially. I wanted something with large pattern pieces to show off the color changes, which run selvage to selvage, and I wanted something that would look less structured and more flowing. I bought a pattern, then once I had a better look at the construction I decided against it. 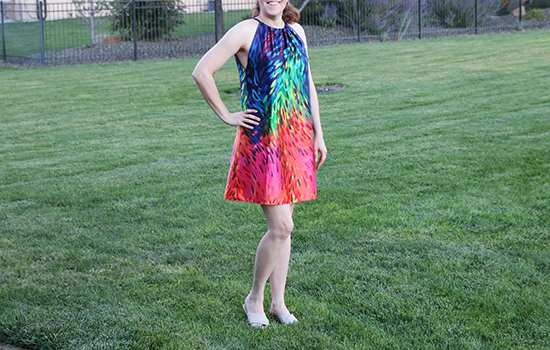 That pattern, which shall remain unnamed for now, called for up to three layers of fabric across the front, which is completely impractical for an outdoor event in July. Then, after the wedding had come and gone, I picked up McCall’s M7405. I thought the combination of the draping in the pattern and the large pattern pieces would work well with the fabric. I chose View B, with the long-and-short hemline. I cut the pattern pieces across the grain in order to accentuate the color changes. The dark blue is at the top because it goes better with my complexion than the yellow does. In addition, the color difference between the right side and the wrong side of the yellow isn’t as noticeable as that of the dark blue, which was a consideration with the hemline. It billowed more than I expected, and had a bit of a nightgown vibe. A few days later, I decided to adjust it. I took in the side seams enough to bring it back to a true Medium, and shortened the hem to make it like View A. The difference is amazing! Taking off the extra length gave the dress a lot more swing, which in turn made it lose the balloon effect. At first, I was disappointed to lose so much of the yellow, but I think narrowing the color palette really adds to the dress. I’m really excited to wear it now! Maybe the summer weather will come back for one last hurrah before fall truly sets in.